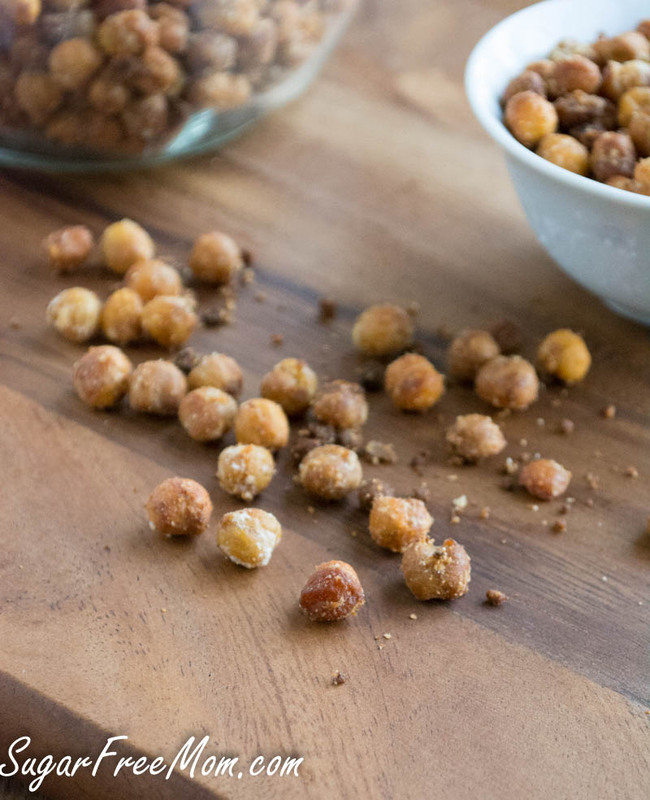 Garlic Parmesan Roasted Chickpeas are a perfect for those with nut allergies! Do you know anyone with nut allergies? Do you have a child with nut allergies? I have 2 boys, one with a tree nut and peanut allergy and the other with a peanut allergy and soy allergy. Feeling awful that I could eat crunchy nuts as a snack, so can my daughter and hubby, the boys felt left out. So one day I was making a salad with chickpeas and thought, “I wonder how this will work if I baked them? Would they crisp up? Could they work to make a crunchy nut substitute for my boys?” Obviously they did! I wrote this original recipe back in January of 2012. 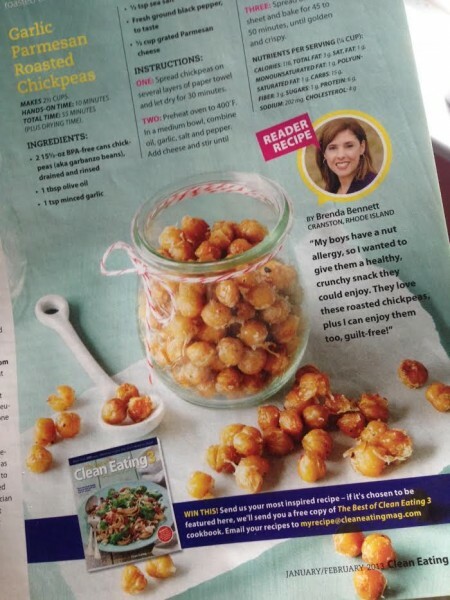 First published on the 6th of the month then picked up by the Clean Eating magazine and they featured it in their January/February issue of 2013. Now of course they are UBER popular everywhere with a huge amount of variety. But for us this plain and simple recipe wins over the sweet ones or spicy ones every time. This recipe is certainly going into my cookbook. I’ve got about one week left until my manuscript is due. Panicked is an understatement. 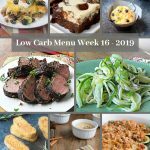 So instead of bringing you a new recipe which will have to wait until Sunday I decided to share the updates I made for these to go into my cookbook. 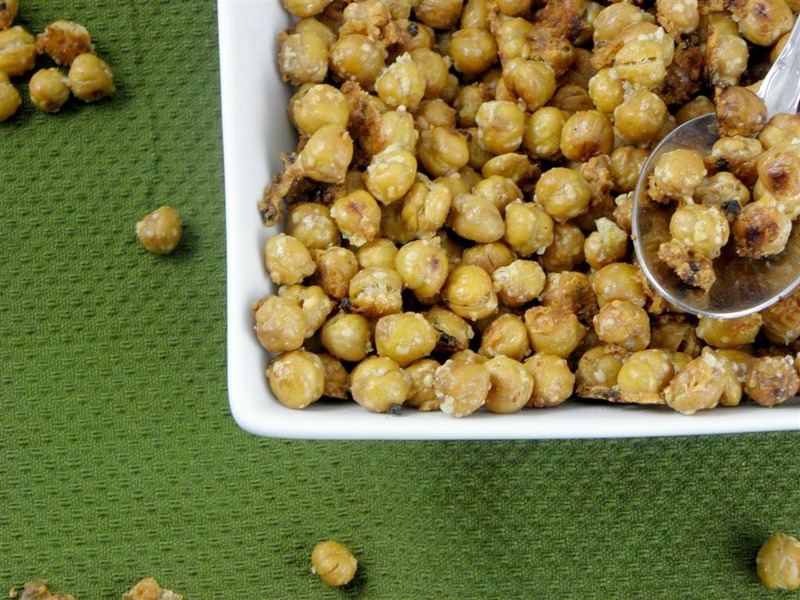 Garbanzo beans are my favorite and my family just loves them. 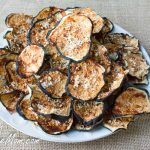 They are super healthy and this is a quick easy recipe to make everyone will love. 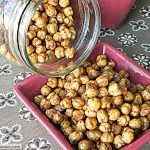 My original recipe, Crispy & Sweet Garbanzo Beans, were a big hit, but I never made them much because of the fact I would always forget to soak my beans overnight. I wanted to experiment with canned because I had been asked if they would come out as crunchy as the original recipe. and hesitant…..but I decided to try anyway and bought two cans. I thoroughly rinsed them and laid them on a paper towel to dry for about half an hour. Mixed up the ingredients to coat them in a bowl, which literally took 5 minutes and popped them in the oven for 45 minutes. They were perfect! Just as crunchy as using uncooked, overnight soaked beans. Actually I couldn’t believe it was true, so I kept having to try them, over and over and over again….you get the point. WARNING: Do not make these prior to dinner or you will be munching on them the whole time and we were! They are sooooo good, really! You could add Cajun seasoning and make them spicy if you wish, but I will stick to this. In fact, my family actually prefers these now over the sweet ones, go figure! I substituted the one tablespoon of extra virgin olive oil in the original recipe for 2 tablespoons of coconut oil. You can certainly use whatever oil you like. The original recipe just mixed the oil and seasonings together in a bowl but I changed that slightly to what you now see below. I feel it coated the chickpeas better and drizzling the final tbsp. of oil over the top after helped them crisp up nicely. Since many comments have been that some chickpeas are soft in the center and some are too crispy, I changed the time of baking to 20 minutes and stirring more often to avoid that issue. The result was a great crispness for the whole batch. Drain the beans and rinse them well. Lay them on paper towels to dry for about 30 minutes. 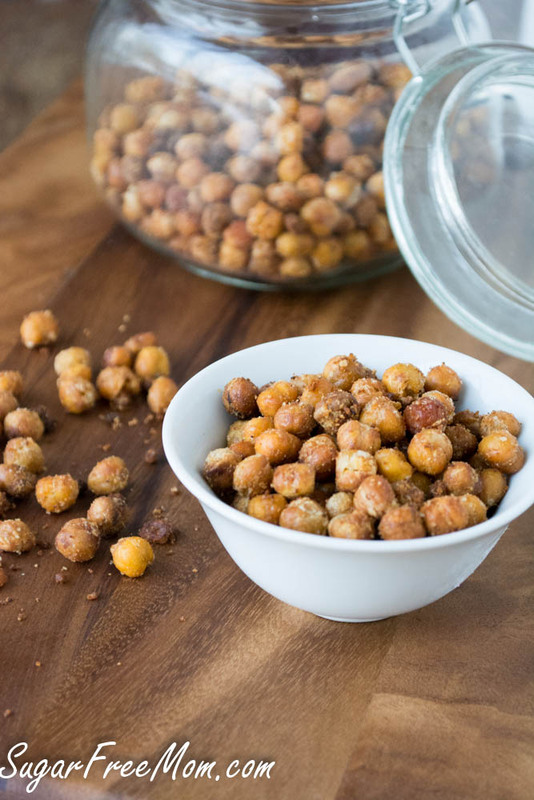 In a bowl, mix together 1 tablespoon of oil and add chickpeas to coat. Add salt, garlic, and cheese and stir well to coat. Lay beans on a baking sheet and drizzle with remaining tablespoon of melted coconut oil. Bake for 20 minutes, stir and continue to bake for up to an hour or until golden and crispy. Mine were perfect at 45. Garlic + Parmesan, my fave combination! Thanks for sharing this, it looks great! I never would have guessed this was possible. I will certainly be making this soon. WOW! 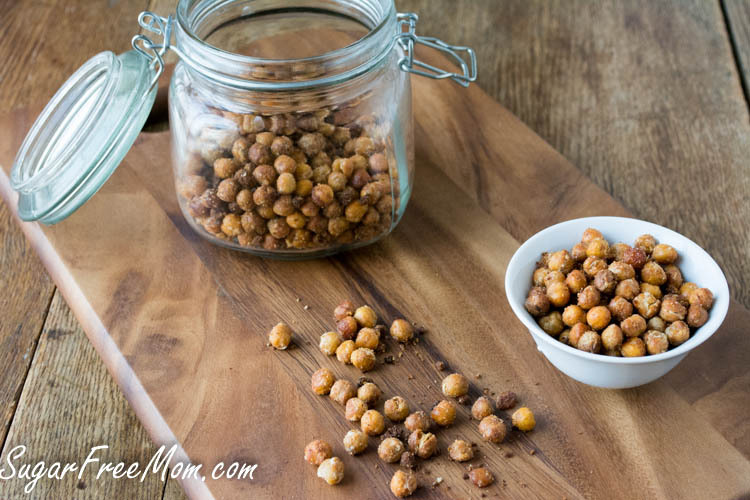 I have never thought to roast chickpeas and add parmesan to them-sounds like a perfect combination! just curious if you have a suggestion to replace the parmesan to make it dairy free? WEll not in that recipe but you could make it just with garlic and salt or try my sweet recipe in the snack recipes section. You could just omit the parmesan or try my sweet garbanzo bean recipe instead. I know this is months after the fact, but in case anyone comes across this with the same question, I was thinking that nutritional yeast might be substituted for the parmesan. I haven’t tried it though. If anyone does let us know how it works out! I used 1/4 cup nutritional yeast instead of Parmesan. Turned out great! You could use nutritional yeast as a substitute for parmesean to make it vegan – it also tastes delicious on popcorn! Thank you for this yummy healthy snack! Wow! 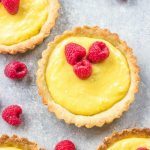 I found your blog because a friend of mine re-posted this recipe on pinterest. 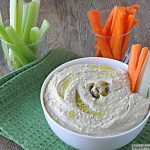 I am 3 months pregnant so I have been looking for healthy snacks and this is perfect! Made my whole kitchen smell like parmesean which was great and the results are so yummy. Can’t wait to try out some of your other recipes. Awesome and congrats on the baby coming! Any idea on how long these or the crispy & sweet ones last? I’d love to just make a big batch and keep them in my cupboard over a long period of time. They sound like a great snack! I actually haven’t had them in our cupboard for more than a couple days. They do tend to soften and lose crispness after 2-3 days. A couple of questions — do you use the fresh grated parmesan, or do you use the Kraft stuff that comes in a green can? Also, wondering why your protein count is drastically different than mine — perhaps it’s the brand of garbanzo beans? Mine says right on the package (I used dry chickpeas — Whole Foods 365 Organic Chickpeas) 10g of protein per 1/4 cup. I looked over to your sweet and salty chickpeas (which I’m trying next!) and it was only 2g protein?? 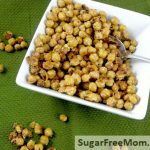 And for your sweet and salty chickpeas, what would you substitute for the sucanat (I do use sugar but I try to in moderation!)? Brown sugar or?? Your site is great! Either parmesan is fine to use, won’t alter the recipe at all. Brown sugar could be substituted for the sucanat if you don’t have any, although I have not tested the recipe with brown sugar. I used the Goya brand canned for the parmesan recipe and its only 6 grams of protien in 1/2 cup. For the organic dried beans I have, it is 7grams of protein for 1/2 cup. I’m not sure why yours is higher. You can also look up the nutrition info on http://www.myfitnesspal.com, hope that helps. Thanks! Saw these over at Tidy Mom ~ will be trying these. Thanks for recipe. Why did it take 9 pages to print it ? Why did it take 9 pages to print this recipe ? so sorry I don’t know why that happened, was it from comments? i will get my IT person on that! Re printing: maybe your IT person can create a “printer friendly” version that prints only the recipe with no headers footers or extras? I love this website too BTW! you can just copy/paste onto word or something. it isn’t hard to do. then you won’t get anything except the recipe. YEAH! So glad even the picky ones love this recipe! Mine included LOL! 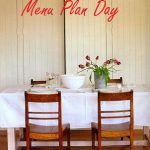 I just posted this to Pinterest- what a fabulous idea! I can taste them now! I must try this!! Thanks! Yummy!! They just got out of the oven…and i feel like i may not have any left tomorrow. I skipped the salt and pepper, but used like 5 big garlic cloves (and i may use even more next time!). Thanks for the idea! It seems like my cheese mixture didn’t stick well to the chickpeas. Is there a way to make it stick better? You could add more oil than I used before cooking or once out of the oven and still hot sprinkle some cheese on them. I am glad I found this recipe & the sweet/salty recipe too, because I just found a can of chick peas in my cupboard (bought by mistake)& had no clue how what to do with them! Needless to say they are both in the oven as I am posting this-thanks for sharing! I’m new to your site….found you thru Pinterest! Trying to eat healthier and get my fam to do the same. I just made these b/c I had all ing. on hand…..and they were delish! Trying to stop eating them! I named them “chipmunk treats” hoping the kids (5yo & 3yo) would eat them. No such luck, but I’ll keep trying 🙂 Thx for doing what you do. I’m your newest follower! thanks for trying the recipe! 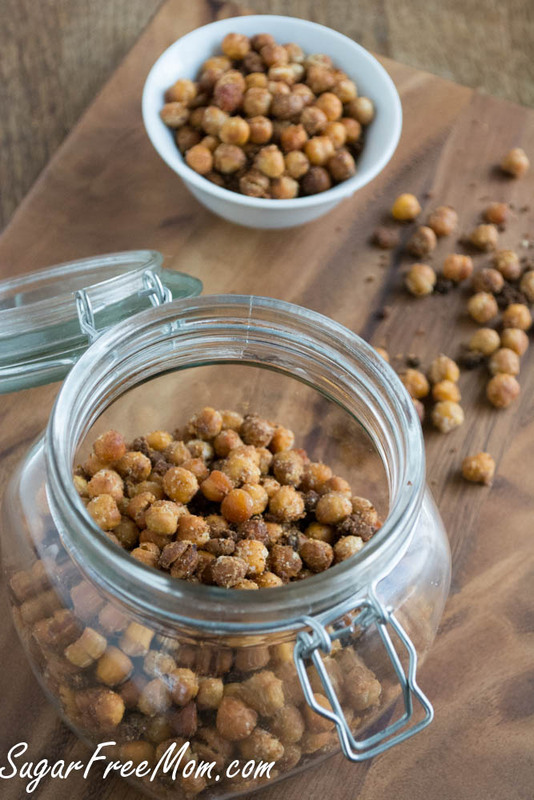 Keep trying with the kids, you might want to try the sweet garbanzo recipe with them instead of this one. They might like it better. Well just put them in the oven!! I did not have minced garlic but I did have organic garlic salt. I used the gs to replace the minced garlic and did not add the extra salt. I had package Sargento Parm cheese. I will let you know if they are trashed or devoured!! My daughter has a nut allergy as well and LOVES these! We use non dairy Parmesan cheese that we get from the health food store. It is veggie cheese but with the parm flavor and tastes the same as the real stuff! That’s great! So glad she likes them! I had the ingredients so am making these NOW! Thanks for sharing this very easy snack. I made this tonight and it was delish. Will be makimg this again and will try the sweet version too. Thanks for sharing. I am not a fan of it taking 4 pages to print. Hmm, did you use the print button within the recipe? That shouldn’t have happened. Definitely going to try out this recipe! 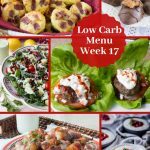 Would just like to say that I’m loving your site and from somebody with a nut allergy thankyou so much for all of these recipes! It’s so hard to find even just a granola bar without nuts that isn’t packed with sugar so thankyou for making it easy! ok, with all the wonderful reviews either i did something wrong, or i need to adjust my expectations. Crunchy, i was expecting consistency similar to wasabi peas. mine turned out just dry with very little to no crunch and on the verge of burned. I used canned peas, which sat several hours on paper towels. I love this concept and am very hopeful they will turn out for me. Try, try, try again, next time lower temp and with convection. The snack possibilities are endless. I had the same experience. I just finished making. I did everything I was supposed to, stirring, lots of seasoning, enough oil, and they are all different levels of done. Most are not crunchy in the middle, but the outside is too dark already. And I guess I need to dump even more seasoning it may have cooked off. The only thing I can think is my baking sheet was not the same as most people here. I never tried anything like it! I just made them and i have to say they taste fantastic, they were done by 30 mins in my toaster oven. I used one can instead of two but life changed! Yum. I’m definitely going to make these for my daughter. Love these! Disappointed the next day though as they had softened in the ziploc bag. Will re-bake them today to crisp back up and try storing them uncovered (if they last that long!) Thanks Brenda for all the great recipes. I’m a Wellness Coach and recommend your site frequently. I prefer spicier condiments so I tried replacing with lime juice and chipotle, delicious! Also delicious with Cajun spice, or piri piri, etc. 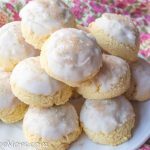 I love these, so easy to make and delicious! Just thought I’d post about my last batch. We love garlic so I thought I would try it using garlic olive oil instead of regular or coconut oil (I make them both ways). Omg! They tasted so good we couldn’t stop eating them!. 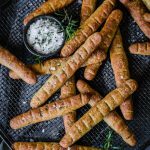 If you are a garlic lover you will love these! When using dried beans soaked overnight. Should I boil them first or just bake them straight after drying on a towel for a bit ? 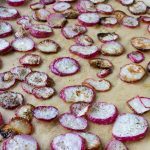 They do not need to be boiled, just dry them as bake following the recipe.